Amazing quality at an amazing price – - that summarises our extensive new 2010 Exage BX STC range of Telespin, and Mini Telespin rods. XT60 blanks, Shimano Hardlite Aero Guides, Easy Access Hook Keepers, and Hardcase storage tubes are found on all these rods. Upgraded with Vibraspot reelseats to feel the tinniest of bites. For anglers wanting top quality spinning rods with a minimum of transportation length. Combine these rods with 500 or 1000 size Shimano reels and you have a perfectly balanced, go any-where outfit. 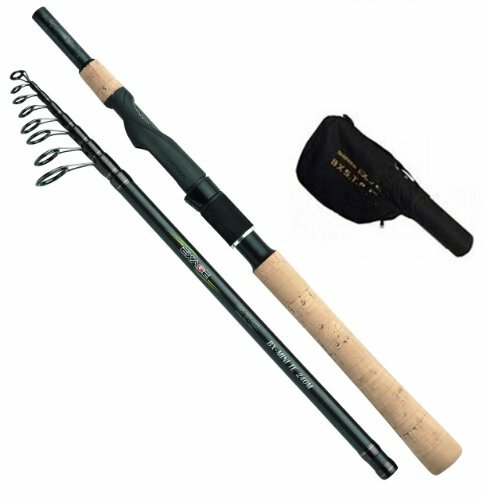 This travel fishing rod will convince you. Comes with hard rod case.